Yumblog recently got upgraded! Check out the new look! This section tells you how to create this new look. To create this new homepage, you will need a Page Builder, we recommend Beaver Builder. (It saves you so much time and you won’t believe how easy it is). 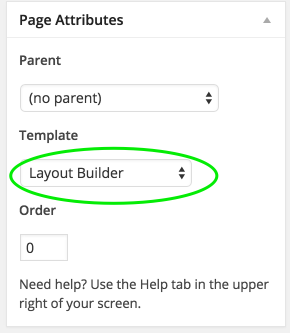 Build your new page with easy drag and drop features of the Page Builder. Voila! You have a brand new look for your Yumblog! The header image dimensions are 385×102. When uploading a custom header image, it can be less than 385 pixels wide and less than 102 pixels tall but never wider or taller than the maximum dimensions. Note: You need to have the Jetpack plugin installed for the Featured Slider to work. In the WordPress admin, click Appearance → Customize. When the Theme Customizer opens you will see a sample of your site and a sidebar. Click the Featured Content tab. Click Posts and either “Edit” or “Quick Edit” a post you would like to be featured in the Slider. In the Tags section add the “Tag name” you added to the Featured Content Customizer earlier. The slider will appear once you have tagged at least two posts with the tag you just selected. Yumblog supports 4 menus; Main, Secondary, Mobile, and Social. Note: This image of the Mobile Menu shows the menu expanded. You can create a unique menu for mobile by choosing the mobile location when creating a menu. The Main Menu displays on mobile when you don’t create a specific Mobile Menu. Once you’ve added all your profiles, click Save Menu. Recipes can be added to your posts with the Recipe Schema plugin. You must first install the plugin and then you will have the ability to embed recipes using the new Recipe meta box below your WYSIWYG content editor on the Edit Post screen. Once you’ve added a recipe, it will now appear with a hand-written notepad style. Yumblog now comes with Cooked – A Super-Powered Recipe Plugin. A $25 value that’s baked right into Yumblog…(pun intended). Once you install or update Yumblog you will see this new plugin within your Installed Plugins. With Cooked you can create a page like this. Once you activate the Cooked plugin you will see an added icon on the admin menu, called Recipes. Be sure to check out all the cool features Cooked has to offer! If you are currently using the Recipe Schema we do not have a migration plugin to move to Cooked. 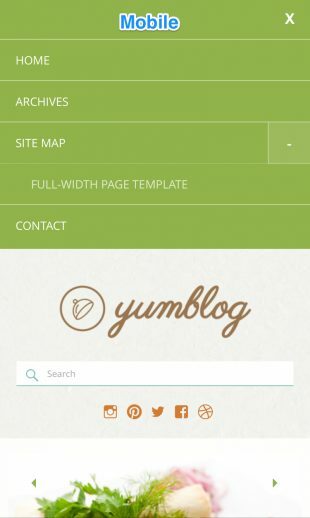 The content width for Yumblog is 560px wide. Featured images are set to display at 570px by 400px. Slider images are set to display at 960px by 500px.